But fixing legacy applications often means making many smaller improvements. Many of these are often a matter of personal opinion. And when multiple developers do agree on an issue, they might not agree on a particular solution. The best way to avoid these nonconstructive discussions, is to have a tool to automate such checks. For .NET, NDepend is more or less the de facto standard and is an extremely useful tool in legacy applications. Installing NDepend is a little different. You just download it from the site and unzip it to a location of your choice. It’s best not to put it in the “Program Files” folder, because this will lead to issues with Windows. I put it in my user’s AppData/Local folder. Update: Patrick from NDepend reached out to me and pointed out that there is also an Azure DevOps (formerly Visual Studio Online, formerly TFS) extension. You can find it here. You can also add NDepend to your CI build, but that is currently out of scope for my application. Though that could come up later. My general score of technical debt is a C. Not too shabby, but there’s definitely room for improvement. I’m sticking with the default rules for now. When I encounter any rules I don’t agree with, I can edit or remove them. One thing I still need to do is to choose a baseline. This is where all future results will be compared against. This is useful to know how you’re evolving. Click on the “define” link to choose your baseline. This should allow us to track our progress. The NDepend dashboard should be your starting point for step-by-step refactorings. They point to issues in your code. There’s no need to fix them all at once, but they provide a great insight into where your priorities should be when fixing issues. Fixing the issues mentioned in NDepend will require some refactoring. But how can I know I don’t break anything while refactoring? I will need to have a decent test suite first. If I refactor this intensively, how can I know that I haven’t broken anything? The best solution here is to write several tests first. You can’t be sure that your tests will cover everything, but it’s a better safety net than a few manual tests. Here too, NDepend can help. 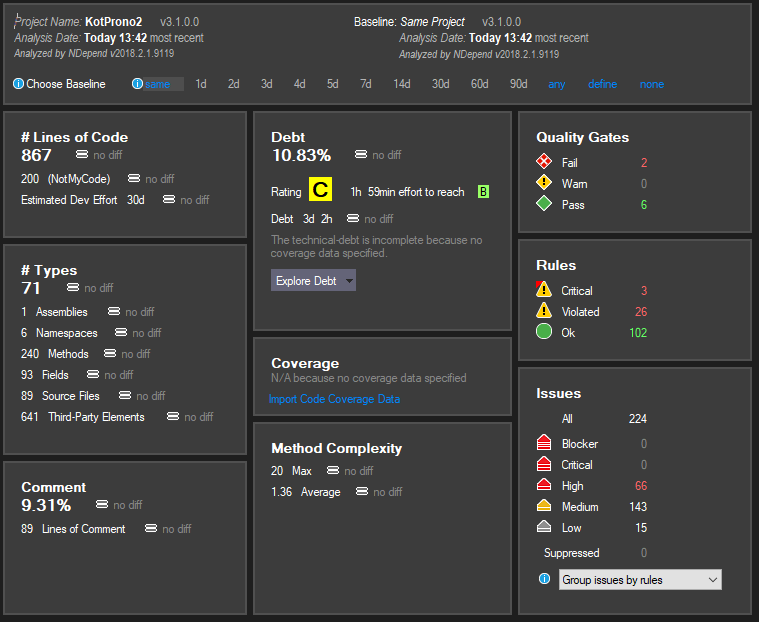 It’s out of scope for this article, but NDepend can take code coverage into account. It’s even possible to define rules based on code coverage. Having tests also provides a better development experience. Instead of having to start the application up to test your changes, you can just run the tests. Thanks to the dependency injection we introduced earlier, we can now easily write tests and mock out the database. Then we will feel more confident when refactoring. This is what I’ll be doing for the coming weeks, and then we’ll come back for another look at our NDepend score.